It's Facebook Fridays! for March 13, 2015! We want you to be lucky in every way possible. 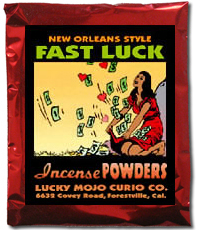 The Lucky Mojo Curio Co. is holding a Friday-the-13th sweepstakes drawing to give away 13 of our legendary Lucky Mojo Fast Luck spiritual supplies, good for gambling or dating (kind of the same thing)! This week the 13 prizes are 1 bottle of Fast Luck Dressing Oil, 4 packets of Fast Luck Bath Crystals, 4 packets of Fast Luck Incense Powders, and 4 packets of Fast Luck Sachet Powders. First thing tomorrow morning, we will select THIRTEEN winners at random, announce their names here, contact them via Facebook to get their mailing addresses, and send them their FREE Fast Luck products. THIRTEEN winners this week. Get on over to Facebok and sign up now, folks! We have a winner! In fact, we have 13 lucky winners! Our Facebook Fridays! winners for March 13, 2015 are: Monique Bishop, Dylan Wilde, Tara Loversidge-Nixon, Amelia Cox, Keith Tiersen, Miriam Noir, Matt Devost, April Crone, Annette James, Peter Francis, Kevin May, Veronica Mosley, Justine Crane.